VPR's renovated and expanded headquarters provides a flexible and collaborative space for VPR to do its best work, as well as a public performance studio. On sunny days during certain times of year, rainbows project on desks, floors and walls throughout the building. Wiemann & Lamphere, the building's architects, claim this this was not a planned design feature. Pianist Simone Dinnerstein debuts VPR's new donated Steinway Model D concert grand piano before a live audience in Studio One. VPR's reception desk contains fossilized rock from the Lake Champlain Islands. 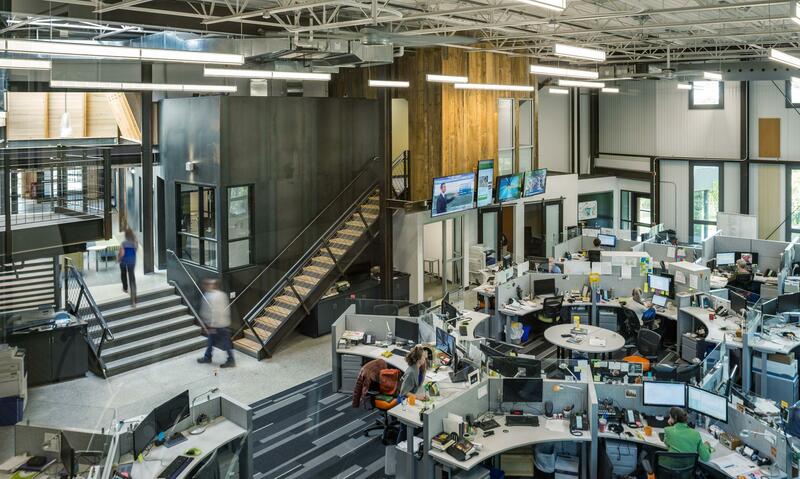 This original building was gutted and renovated to provide open, collaborative work spaces for VPR Staff. One of the first events held in Studio One was a discussion with NPR Morning Edition Host David Greene. His interview with VPR's Patti Daniels was broadcast on Facebook Live for anyone to enjoy. The view from the front door towards the newsroom. The control room for Studio One is on the left. Michael Chorney & Hollar General record for Live From The Fort in Studio One. The construction team discovered buried gas masks while digging to lay the new foundation. VPR's headquarters is located in Fort Ethan Allen, which was an active military fort during the first half of the 20th century. VPR's Nina Keck discusses her reporting trip to Jordan at a News & Brews event in Studio One. The framing of what would become Studio One as seen from the rear of VPR's property. The lobby as seen from the mezzanine. VPR's facility puts the news, Vermont Edition, programming and digital teams together for the first time. Studio One, VPR's public performance venue, provides opportunities for the community to engage with VPR like never before. In addition to its 120-person capacity, the space is audio and video broadcast-ready so audiences can enjoy Studio One events from anywhere. The facility was built with environmental responsibility and sustainability in mind. It was designed to be “net zero" and the architectural and construction teams have both won awards for “green” construction and environmental design for the project. The foundation for the newsroom as captured by a drone camera. Construction began in June 2015 and was completed in September 2016. Last week, the effort came full circle: Bill Stetson, also a former board member, made the gift that pushed the campaign over the $10 million mark. “It was fitting that one of the first donors to the campaign was also the one who put us over the top at the end,” Turnau said. "The reality is that so many people worked hard to make this campaign happen for our beloved public radio station,” said Stetson. “My participation in this effort means so much to me; I made my first donation to VPR right out of college in 1978!" During the public phase of the campaign, hundreds of people stepped up to participate in a generous $1 million matching challenge offered by the Jack & Dorothy Byrne Foundation. Thanks to amazing support from our community, we have raised more than $9.9 million towards our $10 million goal for the VPR Next Capital Campaign. What a week! We’re thrilled to report that VPR raised more than $402,000 during the launch of the “grassroots” phase of the VPR Next Capital Campaign, which has been matched 100 percent by the Jack and Dorothy Byrne Foundation. Overall, we’ve raised more than $8.75 million of our $10 million goal from more than 1,500 supporters.